Simple... yes! Salmon is all about simplicity. It has so much natural flavor, you don't have to do much to it to make it special. This dish is an example of how you can make something healthy and simple with great flavor. Remember to use fresh herbs and fresh salmon - it makes all the difference. Salmon, like all fresh fish, should not be overcooked. This dish may require the toothpick test. Coat the bottom of a shallow baking dish with olive oil. Put the salmon fillet in the baking dish. add a bit more olive oil to the top of the salmon, coating evenly. Add the salt and pepper. Squeeze the lemon juice on top of the fish. Spread the lemon zest and dill on top of the fish. 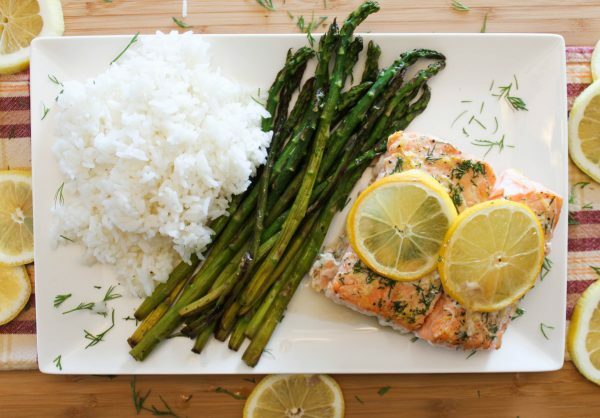 Place the lemon slices on top of the fish. Cook for 15 minutes. To finish, place the fish under the broiler for 5 minutes.